I was gutted. Disappointed. Ashamed. The first round of elections took me back to Judge Brett Kavanaugh’s recent confirmation to the Supreme Court and to Trump’s victory in 2016. Oddly, it also gave me flashbacks to a time and a context that aren’t mine: 1939 in Germany. But now history seems to be coming back as a farce in my home country. I pinched myself to see if this isn’t just a nightmare — but no, it is all too real: Jair Messias Bolsonaro will probably become our president, president of Latin America’s largest democracy. Now, as we’re approaching the second and final round, we leave Ciro Gomes behind. Gomes represents what I would call the neutral alternative to the two opposing forces that divide Brazil in this election, namely Bolsonaro from the Social Liberal Party and Fernando Haddad from the Workers’ Party. Part of the Democratic Labor Party, Gomes even announced that, as a defendant of democracy, he is surely not getting behind Bolsonaro for this dispute. We must realize how cautious we need to be, otherwise we might soon regret the election of a potential dictator. In order to contextualize this topic better for readers who aren’t so familiar with Brazilian politics, fundamentally, it is the truly alarming amount of crimes reported daily, the unemployment crisis, the present state of economic depression and the flagrant corruption across the nation that have brought us to the awful position we find ourselves in now. The dissatisfaction with the Partido dos Trabalhadores (PT), the Workers’ Party that has ruled Brazil for the past fourteen years, has only grown, and a new face and a new strategy seem to be what the people desperately desire. In other words, many are opting to believe anyone, even Bolsonaro, is better than persisting with PT’s Lula and Dilma Rousseff’s legacy. Both former presidents have had their names involved in numerous corruption scandals that have led to the imprisonment of the first and a coup that impeached the latter. To understand this election, it must be mentioned that former President Lula was also running in this race. In August, polls still showed him in the lead even after he was in jail. Only in September did the front-runner have to drop out of the race, naming former mayor of São Paulo Fernando Haddad as the PT presidential candidate. This left little time for Haddad to lead an effective campaign. One is compelled to ask what this election would look like had Lula been the original PT candidate and whether Bolsonaro’s popularity has something to do with the creation of a political vacuum by the former president’s imprisonment. Nevertheless, while we seek for a thorough system renovation, I must caution that it is a dangerous path to cross with Bolsonaro in particular. And it’s not just me who’s saying it: newspapers from many countries — including highly renowned ones like The Economist and The New York Times — have made a case for why his controversial and discriminative policies aren’t what Brazil should be aiming for. More than that, the influence he’s been exerting on the masses is what frightens me the most. His words have fueled verbal and physical violence towards specific minority groups: black people, women, homosexuals and natives. Amid the cases that have been reported, the one fatality that we mustn’t be forgotten that illustrates the true menace of electing Bolsonaro is the assassination of Marielle Franco — Brazilian feminist, politician and human rights activist — earlier this year in March. It is a blatant anti-female, anti-black and anti-queer act of violence. Facebook and my Whatsapp family group chat (filled with fake news that they have been receiving, innocently trusting and sharing around these past few weeks) have also reflected the extent of the repercussions of Bolsonaro’s rhetoric. It’s frustrating to try to have a proper discussion with some of them as it always ends in a fight. How has the realm of acceptable discourse shifted so much that so many Brazilians almost seem to be unaware of what we as a country are really getting ourselves into? How did people become so disenchanted with the corruption of the establishment that they decided to put their faith in a man that speaks of gay people as having “inferior blood”? A man who says that, when he privatizes the Amazon forest, he’ll leave absolutely nothing to the indigenous reserves? And who, in speaking about the descendants of slaves, says they don’t even manage to procreate anymore because of their laziness?… Has the anti-Workers’ Party narrative that has personified corruption in this single party — though it’s present all across the political spectrum — gotten many Brazilian voters to think that the only way forward is by putting a strongman in power? Have our far-right politicians been encouraged by the success of and inspired by the ideas of other far-right politicians such as US President Trump, as mentioned above? As I scrolled through my feed and read posts from friends who are in favor of him, I realized the importance of the October 7 election. This huge number — forty-nine million, two hundred seventy-five thousand, three hundred fifty-eight — opened my eyes to how long our journey still is, how necessary it is to study, read and educate ourselves, and how little we have learned from our past mistakes. You might ask yourself why anyone would vote for Bolsonaro. Well, his electorate is composed mainly of the white middle class, although his popularity increased substantially in all regions of the country with the exception of the Northeast, which is known for being the poorest one. Essentially, the frustration with the PT administration, despite their multiple initiatives and projects that focus on promoting equality and providing assistance to the lower class as a socialist/social democratic party, is inducing the vast majority of the population to run away from the perceived possibility of having some sort of Venezuela implemented in Brazil. Fortunately, there’s still a speck of hope. When I remember how wonderfully inspiring the demonstration I attended here in Berlin on September 29th was, I have faith that we can reverse this situation. The mobilisation in Berlin was only one of many that took place that day — others occurred in France, Canada, South Africa, to name a few places. Seeing that my fellow Brazilians abroad are also concerned with these troubles at home gives me courage. Living in another country and only being able to fill out a form justifying why I’m not in Rio at the moment and can’t vote during arguably the most heated elections I’ve seen so far makes me feel impotent. 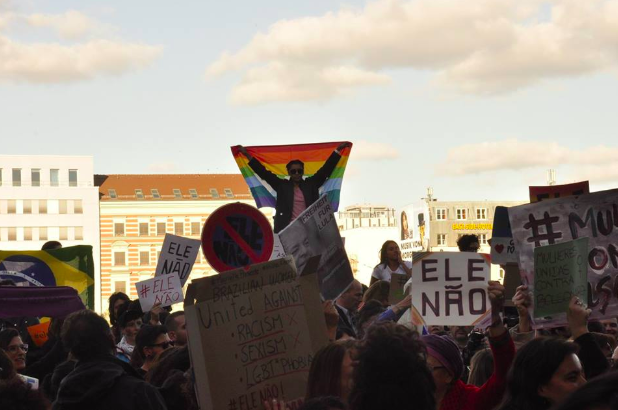 Yet, at the May-Ayim-Ufer in Berlin, the event “United Women Against Bolsonaro” brought together both women and men of all ages, colors, and accents who sang and screamed their lungs out. The Ordem e Progresso printed on our green, yellow and blue flag, between the cardboard posters, the white roses, the well-known chants in Portuguese filled with rage and passion simultaneously, the warm, welcoming atmosphere, and the willingness of the people to combat hate is what keeps me going and gives me peace. For a short while this diversity and happiness made me feel at home… perhaps more at home than if I were actually to be at home, on account of the current turmoil that has recently stolen our smiles. Still, the 54% of us who voted for other candidates could put aside our ideological differences in order to vote against Bolsonaro. We have two weeks until the second round between him and PT’s Fernando Haddad to recover from the state of mourning we currently find ourselves in. We must resist the pressures of allowing a man with such bigoted and radical views to govern. This is not the time to give into our fears that our fragile democracy might disappoint us once again by delivering a Workers’ Party president that is less than perfect. We should instead be fearing Bolsonaro’s strong inclination to rip it apart completely. I pray it’s enough. I really, really do.